My past few runs have been only about 3 miles long, but have included a 700 foot elevation change. 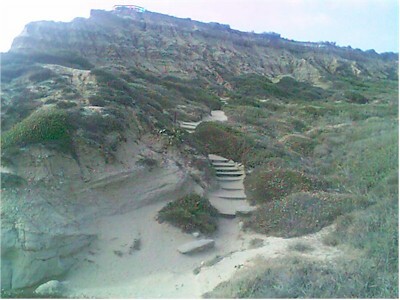 Taking the trails down the cliffs at Torrey Pines is easy. The 350-foot climb back up the hill is not so easy. This is a view from near the bottom. (The bright spot near the top left of the image is a nice example of the pixel saturation my Kodak mc3 camera, which happens to be the easiest one to carry during a run.) The fence at the top of the hill here is a lookout at Yucca Point, which, from my starting point, looks like it's right next to the water. Sometimes I am so tired that I have to take these stairs with baby steps, three steps per stair. I'm hoping to get a bit more used to it in the coming month and a half and beyond.